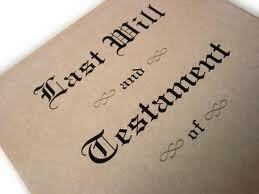 “Intestacy” is the legal term for those who die without leaving a Will in New Jersey. With no written documentation of how (and to whom) you wished to leave your property, the State of New Jersey will make those decisions on your behalf through the “intestate succession” laws contained in Title 3B of the New Jersey Statutes Annotated. Naturally, the State of New Jersey’s rules for distribution of your property probably differ quite a bit from what you’d have wanted. Having a Will allows YOU to make these important decisions now, rather than having the State make these decisions for you after your death. A Will also eases the burden on your surviving family members, who may not have known of your wishes if you die without a Will. While New Jersey will under certain circumstances allow handwritten Wills to be probated, strict rules and legal technicalities apply. “Do it yourself” will forms from stationary stores or the Internet may contain flaws or errors, such as lack of proper witnesses, missing pages, etc. These forms are rarely state-specific, and may not comply with New Jersey’s probate rules & laws. ● Planning/special directive trusts for family members with chronic alcohol or substance abuse issues.